I don’t know whether seeing a fictional genius using Surface helps sales, but if so, it’s not helping enough. The Surface slate is on the skids in retail, as are Windows 8 computers. It is perhaps not surprising that Microsoft’s retail users are slow to migrate from the familiar (PCs running Windows 7 and XP) to the unfamiliar (PCs running the radically different Metro interface, and a new product category in Surface). But swampy sell-through is definitely surprising financial analysts, some of whom are cutting Microsoft’s revenue forecasts. Microsoft is doing a lot right in placing its long bet on ecosystem coherence. But along the way it is making unnecessary mistakes. The Surface RT and the Windows 8 operating system were both released on October 26, so Microsoft is more than four months into its grand experiment. The panicky media coverage of Surface sales carries over to Windows 8 computers with even more alarmed punditry. Windows 8 machines are sitting in stores. Some observers are calling Windows 8 the new Vista — a hard and mostly undeserved slap to the face. Vista was functionally poor; Windows 8 is battling an inertia problem due to its unfamiliar interface and lack of compelling problem-solving. Two of Lenovo’s five best-selling laptops (updated hourly) are Windows 7 machines as I type this. PC sales have been slowing across the board, quarter by quarter, as consumer dollars shift to slabs and phones. Two reasons for slow Windows 8 PC sales come readily to mind. First, touch-enabled laptops running the new OS are more expensive than non-touch versions, giving consumers a reverse incentive to adopt a new screen experience which is clearly designed for touch. Second, PC sales have been slowing across the board, quarter by quarter, as consumer dollars shift to slabs and phones. Meanwhile, Microsoft’s many lines of business add up to a healthy company whose last quarterly report (fiscal Q2 2013, ending December 31) showed substantial year-over-year gains (26 percent top-line advance for the Windows division). At quarter’s end, the company had sold more than 60 million Windows 8 licenses. That robust figure implies that consumers are reaching for OS upgrades on existing machines, a generally successful operation, rather than unnecessarily spending more for a hardware refresh. The Windows business as a whole enjoys powerful momentum. Windows is a multiple-versioned product, obviously. On the enterprise side, more than 60 percent of desktops are running Windows 7. Overall, Windows 7 owns 45 percent of the market, and XP steadfastly hangs on to 39 percent. 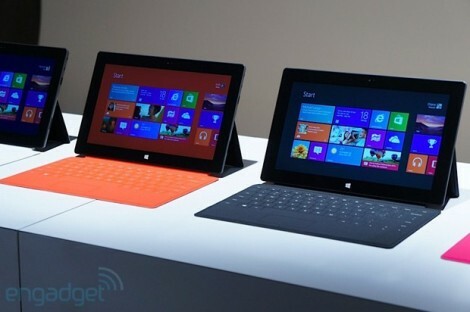 Windows 8 claims a slim 2.6 percent share as of February. The point of this pie-charting is that Microsoft’s computer OS footprint is a mighty 92 percent across all Windows versions. That sprawling dominion can seem threatened by slow Windows 8 uptake, in the context of an accelerating post-PC world. But Steve Jobs was not really right about that — at least, not yet. It is less a post-PC world than a co-PC world. The computer is far from dead, and infotaining tablets are far from being productive replacements. The high-powered Surface, in fact, is the most-aligned to productivity in the field. Technology ecosystems are complex matrices of cross-wired businesses, and the major examples sharply differ from each other. Each of the chief players — Apple, Amazon, Google, Microsoft — imprints a unique eco-template on the marketplace. Each seeks to capture as much digital living within its branded walls as possible. These lifestyle silos include walking around, driving around, being passively entertained in the living room, being productive in the home office, working a job, creating media, searching / finding information, shopping, storing digital possessions, navigating the virtual realm, navigating the physical realm, talking on the phone, texting, socializing in other ways, gaming, etc. Each aspect of life is a business unit in one or more tech ecosystems valued at billions of dollars. Windows 8 and Surface together represent a prodigious bet to round out an eco-branding ploy which hits all major product categories with a consistent look and feel. It is the insistence of that last point, the Metro interface everywhere, that is unnecessary and harmful. The important question isn’t whether consumers will adopt Windows 8; the question is whether Microsoft needs consumers to adopt a computer OS that looks like Windows Phone handsets and Surface tablets. The important question isn’t whether consumers will adopt Windows 8; the question is whether Microsoft needs consumers to adopt a computer OS that looks like Windows Phone handsets and Surface tablets. Does a desktop OS need to provide interface continuity with the organism’s mobile extensions? Apple, the ecosystem champ since it first brought iTunes to market, doesn’t build that way. The functional Windows 8 operating system isn’t the chief retail problem. The Metro interface, the blue-tiled placard of a new Microsoft, so different, so strangely touchy and so clearly emblematic of mobile functioning, is what is driving product confusion and refusal to engage. Removing the Start button in Windows 8 is Microsoft’s first misjudgment. The second is refusing to allow booting to the familiar desktop, which would be a friendly and inviting OS customization. In Windows 8, you can revert to the Windows desktop experience via a tile, and you can further customize the interface with third-party apps which revive the Start experience and return Windows 8 to a 7-like environment. These solutions, while handy, have to make early adopters wonder why they bought into Windows 8 in the first place, especially if they are not using a touch screen. Forcing loyal users through a usage quirk at every boot, just to arrive at the starting point that millions of people have loved for years, is wishful thinking at best, user hostility at worst — and self-damaging in either event. It’s early days still for Microsoft, and category trends are changeable, like swiftly flowing mountain streams carving new paths in the hillside. Mini tablets might complete a takeover of that category, creating headroom for laptop sales to revive. The Surface is just reaching international markets now. The rumored OS update, Windows Blue, could be a corrective that proves more accommodating of consumer hesitation. Over the last 20 years, ever since Microsoft under Bill Gates missed the internet like a hitter striking out with the bat on his shoulder, Microsoft has proven its willingness to arrive late to the party, to persist and to drink its share of the punch.